The Black & Decker Mouse Sander is ideal for general sanding and sanding tight spaces. The tool features high performance dust collection with micro-filtration for a clean workspace and it also comes designed with a 3-position grip for control and ease of use in many applications. The Bosch GSS20-40 1/4-inch Sheet Orbital Finishing Sander delivers even sanding and long tool life, with a precision-machined aluminum sanding plate. It has a beefy 2.0 Amp motor that produces up to 12,000 oscillations per minute (OPM), delivering uniform and smooth results on all surfaces. This tool incorporates low-vibration engineering for user comfort and for enhanced tool life. 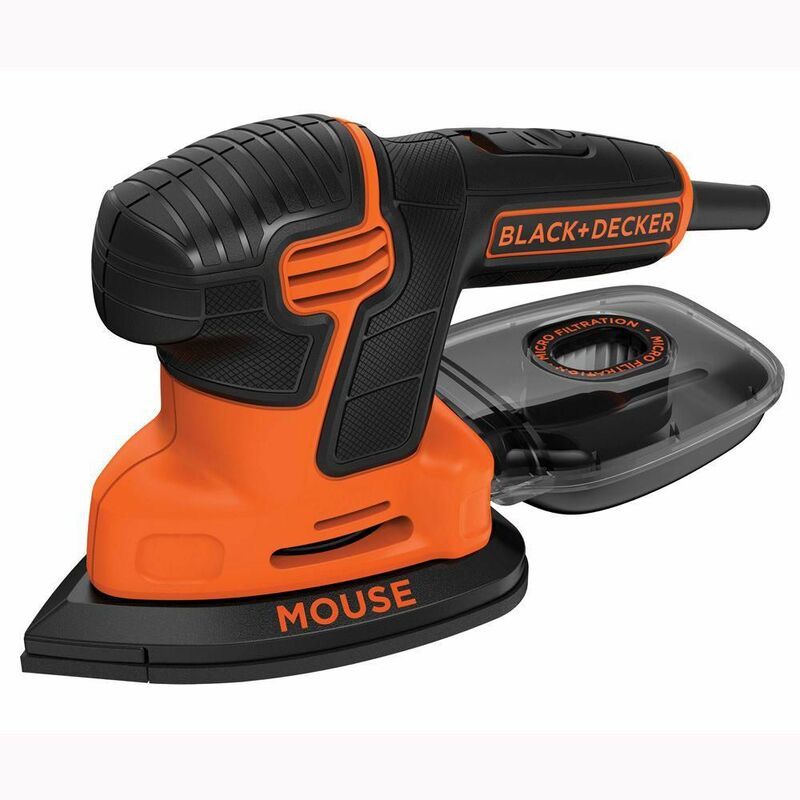 1.2 amp Corded Detail Mouse Sander The Black & Decker Mouse Sander is ideal for general sanding and sanding tight spaces. The tool features high performance dust collection with micro-filtration for a clean workspace and it also comes designed with a 3-position grip for control and ease of use in many applications. 1.2 amp Corded Detail Mouse Sander is rated 3.8 out of 5 by 55. Rated 1 out of 5 by Kat from Do not even waste your money on this, you may as well manually sand because you will need more mu... Do not even waste your money on this, you may as well manually sand because you will need more muscle to move this worthless vibrating machine around than you will simply doing it by hand. After sanding 6 kitchen cabinets, my hand was vibrating for 30 minutes and I felt like I just got home from the gym. I finished the rest of the cabinets by hand, it was literally faster and easier. Bottom line, all this thing does is vibrate, it does not sand anything and the dust catcher is a joke, the entire room was covered in dust. Absolute garbage. Rated 5 out of 5 by Julia from This little sander is great! It is super convenient. I... This little sander is great! It is super convenient. I used it for sanding a brass door handle to get it ready for spray painting and the pointed little attachment at the top was great. I would recommend this if you sander if you have small spaces or intricate things to sand. Rated 5 out of 5 by Angela from Love this little sander! It’s perfect for my home projects! Love this little sander! It’s perfect for my home projects! Rated 5 out of 5 by chuck from This an awesome little sander with a ton of power.... This an awesome little sander with a ton of power. Dust is minute because the collection system is very capable and efficient. Rated 5 out of 5 by Tazio from broke too soon Used it ove 5 jobs. Finding sanding paper with the proper holes was dificult then on the 5th job it broke!!! The flimsy plastic stand offs broke that attach the pad to the motor!!! Not repairable!!! Definatly not worth the money even though it was cheap! now I need a new one, nit sure what to get? Think ill check out Milwalki! can these be used to sand drywall? No, we would recommend using a drywall sander.